Cut in Alabaster is the first comprehensive study of alabaster sculpture in Western Europe during the late Middle Ages and Renaissance. While marble is associated with Renaissance Italy, alabaster was the material commonly used elsewhere in Europe and has its own properties, traditions and meanings. It enjoyed particular popularity as a sculptural material during the two centuries 1330-1530, when alabaster sculpture was produced both for indigenous consumption and for export. 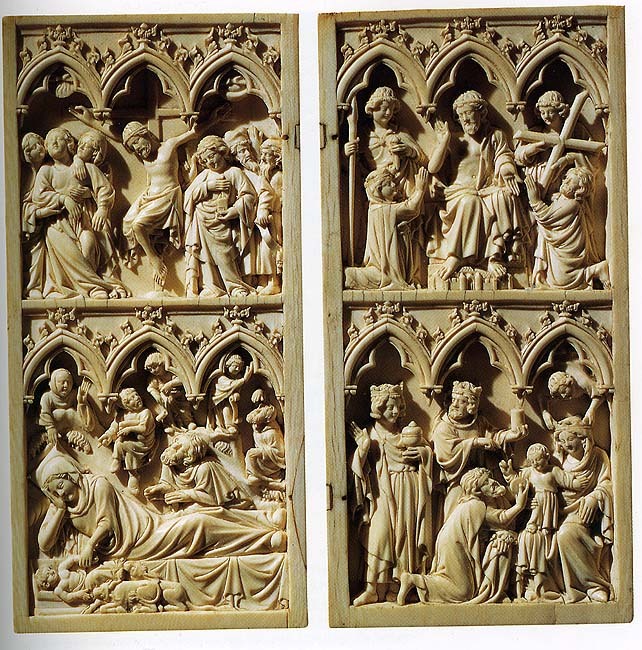 Focussing especially on England, the Burgundian Netherlands and Spain, three territories closely linked through trade routes, diplomacy and cultural exchange, this book explores and compares the material practice and visual culture of alabaster sculpture in late medieval Europe. Cut in Alabaster charts sculpture from quarry to contexts of use, exploring practitioners, markets and functions as well as issues of consumption, display and material meanings. It provides detailed examination of tombs, altarpieces and both elite and popular sculpture, ranging from high status bespoke commissions to small, low-cost carvings produced commercially for a more popular clientele. This entry was posted in Book roundup, Publications and tagged Alabaster, Books, Brepols on March 5, 2019 by ameliahyde. Seminar at the Anatomy Museum, King’s College, London. Attention is an intense concentration enacted in the body and mind. It is something to be attracted or something we give, generously and with due consideration. In theatre and performance, it is that which unites an audience, who are, with PA Skantze, ‘bound in their attention’ (2003) even as it drifts and returns or might ignite dissent. Our attention can be selective, divided; it occupies space and time; it has breadth and span. We draw attention, and desire it. We, and our productions, are attention-seeking, attention-grabbing. We suffer from an attention deficit. FAO brings together thinkers from across the fields of theatre and performance studies, literary history, psychotherapy and essay writing to give attention to attention in all its forms. We will ask how attention is cultivated and distributed in criticism and performance. For critics such as Frank Kermode (1985) and Jonathan Crary (1999) and historians like Lorraine Daston (2010) its various conditions powerfully index their historical times: attention determines value and the forms through which we ‘attend’ to works of art and the social world. This talk will investigate the common ground between two materials widely employed as luxury goods in the later Middle Ages. Focusing on periods of manufacture from the 14th to 16th century, these materials were coveted, fought over, and used for objects which would aid their owners in the most private of devotions, or the most public of spectacles. This talk will address the carving of sculpture, the painting of sculpture and the location, or lack of location for sculpture. Lloyd de Beer is jointly responsible for the late medieval collections (alongside lead curator Naomi Speakman). His academic background is in English art and literature of the fourteenth and fifteenth centuries, and he is currently working on the museum’s collection of alabaster sculptures, pilgrim badges and seal matrices. He has a particular interest in medieval architecture, and the role it plays in framing the visual reception of objects and ritual. Prior to joining the department Lloyd held a curatorial internship at the Victoria and Albert Museum and a curatorial fellowship at the Sainsbury Centre for Visual Arts. He has recently published on English alabaster sculpture, and has a forthcoming book on the Lacock Cup, co-authored with Naomi Speakman out in 2013. Naomi Speakman is the curator for Late Medieval Europe at the British Museum. Her current research interests are gothic ivory carving, late medieval metalwork and collecting history. Prior to joining the British Museum Naomi has worked at Bonhams and the V&A, and is currently undertaking a PhD at the Courtauld Institute of Art on the British Museum’s Gothic Ivory collection. She has contributed to the catalogue for the British Museum exhibition, ‘Treasures of Heaven: Saints, Relics and Devotion in medieval Europe’ and has a forthcoming publication on the Lacock Cup jco-authored authored with Lloyd de Beer. Hosted by the Performance Research Group. FAO is convened by Georgina Guy, Lecturer in Theatre and Performance Studies, and David Russell, Lecturer in English Literature. This entry was posted in Upcoming Events and tagged Alabaster, Ivory, King's College on March 22, 2014 by medievalartresearch.